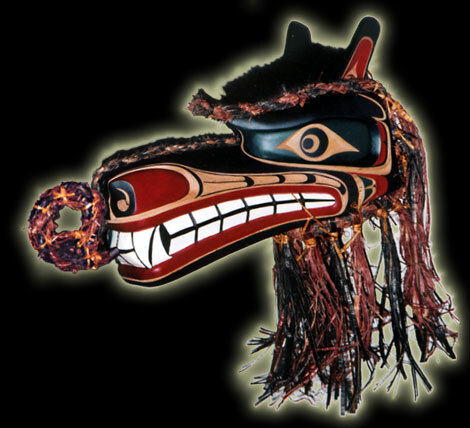 Carved and painted mask with roped cedar bark, natural cedar bark and cedar bark dyed black, intertwined to make braid and skirt. The ears are fringed with tufts of animal hair. The wolf has often been associated with the special spirit power a man had to acquire to become a successful hunter. The wolf was the land manifestation of the killer whale. The wolf is still an important family crest and is often represented on the personal possessions of those with the right to use it. Width - 10" x Length 15" x Depth 18"